On March 11, a tsunami devastates Japan. Amazing force or nature at work that was caused by an earthquake (generally on the ocean floor. Video footage of the tsunami and its destructive force. Japan's coast reportedly moved 8 feet during the 5th most powerful earthquake since 1900. The Earth's axis was altered by 4 inches. 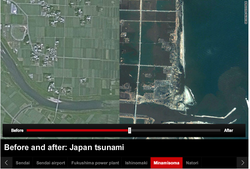 Devastating interactive before and after pictures of Japanese coast. Click the picture to be redirected. 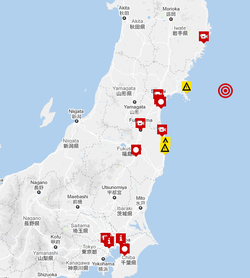 Interactive map of Japan showing where damage was done by the overall disaster. Relief efforts are underway.